Tri-ing to be Athletic: Hey, Did I Tell You I Ran a Marathon? Stretch Goal: Finish in 4 hours, 30 minutes, or less. Realistic Goal: Finish in under 5 hours, based on training runs and knowing that I would have to run 10 kilometres more than I ever had in my whole, entire life. Ultimate Goal: Finish the race. The wheelchair marathoners went first. Then, the marathon runners. The half-marathon runners. The half-marathon walkers. The marathon walkers. Yes. Some people walk an entire marathon! Is that nuts or what? So off we went. Erika instructed Ann Marie to be on my left shoulder, and she took the right, essentially flanking me. Have I mentioned how awesome these two are? We started the run with a 200 foot climb at mile 1. It lasted 1.5 miles, and then we turned around and went back down the hill, easing out onto some flat running for the next 6.5 miles. Along most of the way we had spectators cheering us on, bands playing fun music, and a variety of colourful characters. And pirates offering high fives! Though I really could have done without them shooting their pistols into the air. People in many of the neighbourhoods lined the streets and cheered us on. Poor Ann Marie. Such a long name to be squished onto a race bib. The race provided water and electrolytes, pretzels and gummy bears, and Vaseline on a stick for those who needed to reduce, um, chafing. However, it all was available at the same time and led to occasional confusion. Some of the middle miles of the race were pretty drab and spectator-free, so I plugged in my earbuds for some musical distraction. It worked for a few minutes, but then I started hearing a strange noise. All three of us heard it. It was so annoying. It turned out one runner was wearing a heart rate monitor and was consistently running at a higher level than she had programmed into her device. It was warning her that she was running too fast or hard. Did I say how annoying it was? As for my own race plan, I managed to keep around my goal pace, between 10:50 and 11:30, until we had 2 sequential hills at miles 16 and 17. And then my pace took a dive by about an entire minute per mile. It was tough going for a bit, but my mantra of one foot in front of the other, and my awesome friends, got me through. Once we got back to the friendly neighbourhoods we came across lots of signs. Well, as long as you promise. Not only were the spectators and volunteers encouraging, but so were the runners! I had made us race shirts and the back of mine said "First time marathoner". It was incredible how many people asked me how my race was going! They also had great things to say to my coach (Erika) and the birthday girl (Ann Marie). As I mentioned, there were some very quiet stretches of road. During these moments I had some doubts about my ability to finish the race, as I was getting pretty sore. But then I reminded myself that even though I was hurting, it was ok, because running a marathon is SUPPOSED to be hard. She also checked in with Dr. Tim a few times. This led me to a clear decision sense of melodrama. Erika, of course, was no slouch either. She was a great motivational speaker throughout the race. Though I was not much good on the conversation side of things. She also kept all our friends and family up to date in real time! 24 miles seemed like an adequately generous distance. 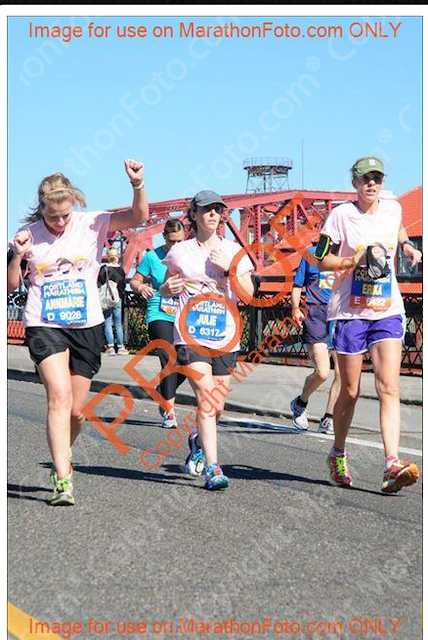 By the time we FINALLY got to mile 25 and change, we saw TriGuy and smiled for the camera. Some of us might have also waved like a maniac. We rounded the corner into the final stretch and came face to face with a glorious finish line! Once we crossed the finish line we got our medals and space blankets. Then we were handed popsicles. Easily the best popsicle I've ever had in my entire life. All I wanted to do was to join the many people who had parked their rears on the curb, but Erika insisted we keep walking because it was better for us. She was so right. As we continued to walk, we picked up more food. We were each given a rose and two satchels with a commemorative coin and a charm that's a mini version of the medal. Then we got our finisher shirts. We stopped for some photos, then met with our supporters, showered, and ate all the food at Wild Buffalo Bill's. You guys, there are not enough words in the English language (or any other) to express how amazing this experience was. Having my friends run with me, having TriGuy there, and all the support from family, friends and readers was just phenomenal. I was NEVER an athlete growing up. But since 2009 I have taken up racing, initially to hang out with my friends, then to really find out what I could do with this body. This delicate, sensitive, always- getting-injured body. I had no plans whatsoever to ever run a marathon. 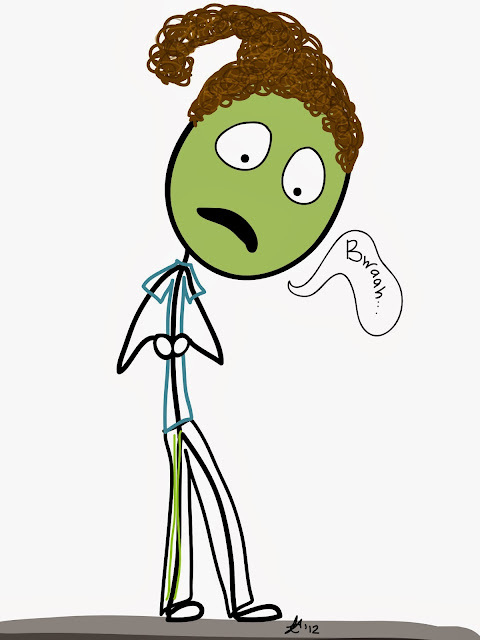 But once I started running more, the idea kept creeping into my head. When people would ask me why I wanted to, the answer was always "Because it's there." Because really, I needed to know if I could do it. I spent the last 4 years learning from my injuries and setbacks, as well as from my successes. This summer I finally felt like *maybe* I was ready to train for a marathon. There were a lot of skeptics, myself included. But aside from being slower than I wanted, nothing went wrong with this race. And as for my finish time? Erika cheering at the finish. 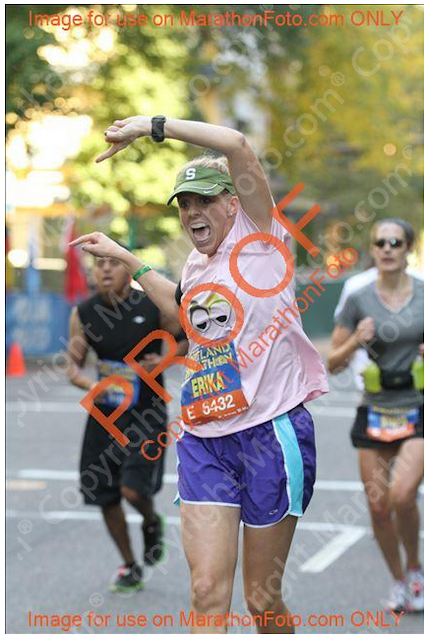 Erika yelling that I was about to cross my first marathon finish line! 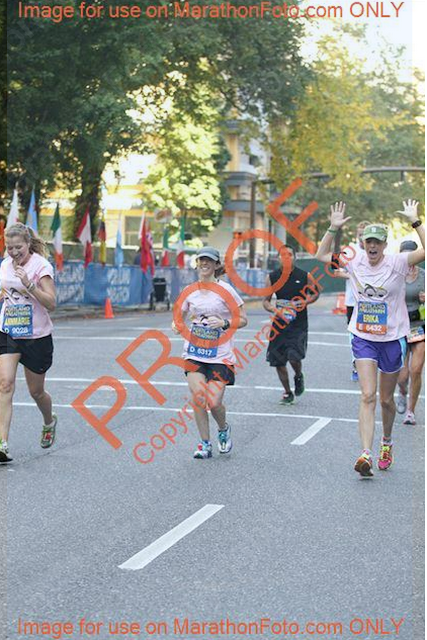 And finally, the official race photo that Erika bought for me! That's it. The longest post I've ever written about the longest race I've ever run. Who's up for a little weekend Moonshine with Yeah Write? Wow!! What an amazing accomplishment!! I loved the stick figure recap. That government sign made me giggle too! That and the wrecking ball cartoon! Haha! Congrats!!! Love all the pics especially the IRL of you beaming. Way to go girl! Amazing, congratulations. You think the walking marathoners were crazy, I disagree, I see them as the sane ones. I mean, I would walk 500 miles and I would walk 500 more just to be the one to...not have to run a marathon. The vaseline on a stick is a great idea, but like that guy, I would have thought it was a treat. The fact that you made shirts is so great. Truly, congratulations on such a great accomplishment. Well in my mind I'd rather run and get there faster :P I forgot that people were offering beer too! Thanks Coco! I never thought about the bells...I think that would make me insane! Wow, awesome job!! And yes, the marathon always hurts- no matter how well trained you are. You did it!! Congrats to you!!! I loved your recap. So awesome. ABSOLUTELY fantastic. Loved every second of it! Congratulations. Awesome awesome awesome!!!! God- it makes me nervous about my marathon in December. At the start if last year I would never have thought I would EVER be able to do a marathon- this December I'm doing my third this year! Running buddies who cheer you in and talk to you, even when all you (we) can do is grunt, is key! I would live to break 5 hours this time around...but I am doing it without a running buddy...and I know as soon as I start I will change my goal to 'just survive and cross over the line!!!!' Well fine again! Next marathon???? Congratulations!!!! Such a great recap and sounds like an absolutely wonderful experience. Awesome!! 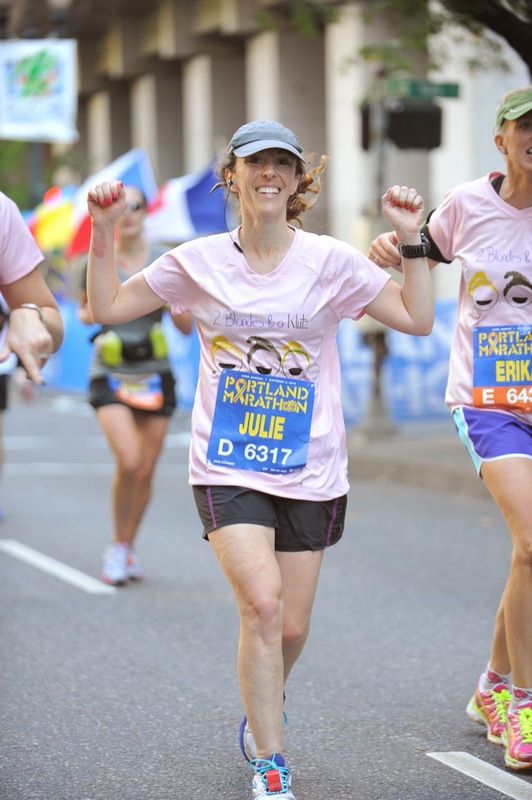 Congratulations on finishing your first marathon! I ran my first (and only so far) in 2010, so I understand how much of an accomplishment this is! It was fun reading about your marathon experience. Thanks so much! It is really an experience, isn't it? BAHHH HA HA HA HA AH!! I literally laughed out loud at the Government Photo and my whole family came over asking WHATS SO FUNNY. LOL! You're a rock star!!! I could never in my entire life run a marathon! Everyone who runs these are CRAZYYYYYYY lol, but I give you LOADS of credit!! Way to go! You give hope to all the non athletes among us like me!! I love your cartoons they really sum of the excitement of the race. Saying hi from the Moonshine Grid! Thanks Emma! Yup, non-athletes *can* do it if we want to. We just have to train like athletes :) Thanks for coming by! Congratulations! What an amazing achievement! I loved seeing the real photos, and what fun t-shirts! Thanks Marcy-it was pretty awesome! I don't know how I missed this post...YAY for finishing your marathon. I love everything about this, and the pictures are your best ever. Thank you so much Samantha! Can't wait for you to do yours! You may never read this comment as I am so far behind with your posts. But everything you said in this post I can understand. I ran my first marathon this year. May 2014. I am running my second next week. I am going to try and do a half ironman next year. I am going to check in more often with your blog. I so wish I'd got one of your tshirts for the marathon. I will do for next year! Good luck with your training and will check in again to see how you did you with your second and see whether you improved your time. My first time was around 5 hours too. I did read it!! Oh my gosh, you are amazing! Good luck with next week's race! Where are you running?